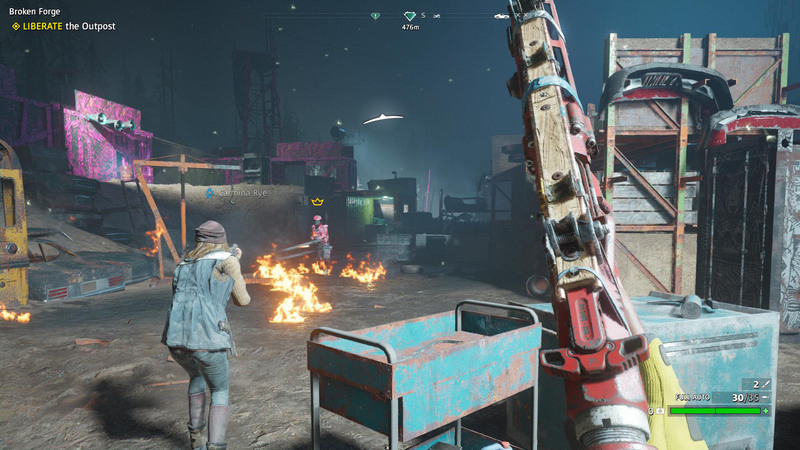 With Far Cry New Dawn you’re back in Montana, but it’s now a very different place. 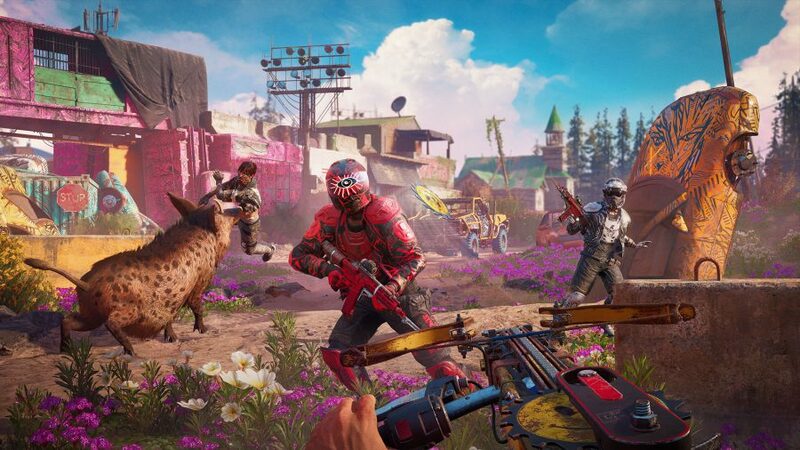 Forced into bunkers for decades following a nuclear war, the people of Hope County emerged to a world dressed in vibrant pink flowers, populated by herds of wild animals, and naked of traditional authority. The government is gone, and so the people form new communities. Some become farmers, others marauders. Ubisoft has experimented with the Far Cry games before. 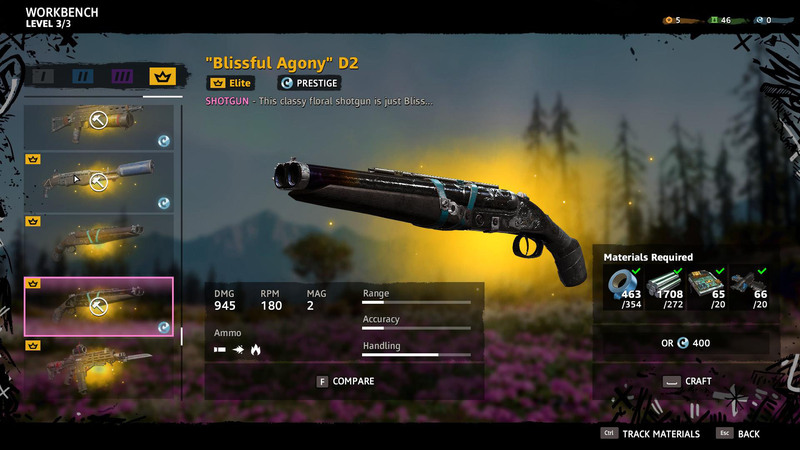 Both Blood Dragon and Primal were significant departures from the full-blooded numbered title that preceded them, but Far Cry New Dawn is the most radical mix up yet. That’s true aesthetically, the Montana landscape repainted in vibrant pinks and blues, but most significantly also in its systems. Most open-world games begin with you as a single island in an ocean of enemy strongholds. You gradually take outposts and sentry points from the enemy, turning a wild world tame. The frustration with that, as a player, is that safe worlds are not fun worlds. As you gain in power, you face fewer and fewer enemies that match your strength. While the story has you arrive in Hope County to defeat the Highwaymen, a group of raiders who are terrorising the local farmers, the systems in New Dawn combat that pacification. Rather than make the world stagnant in the wake of your progress, you gain tools to make pockets of it more aggressive. For instance, you can return captured outposts to enemy hands, who will fortify them and increase their numbers there, so that you can capture them all over again. 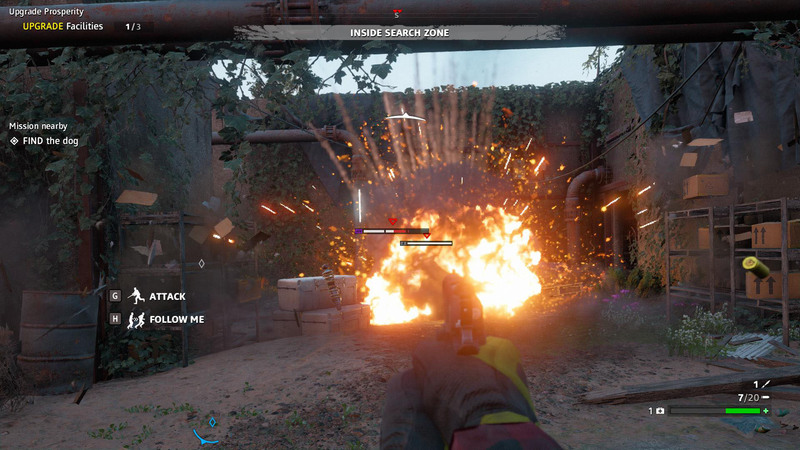 It’s a system that recognises Far Cry is most fun not in scripted moments, but when you’re improvising in the chaos of an outpost assault. You can see that same recognition in the new expeditions. These get to the heart of what makes Far Cry tick. They’re self-contained missions that take place outside of Hope County, each of them an action movie in miniature. The objective is the same every time: get in, grab the supplies, and get to the chopper. The magic of it is that you have the freedom to play how you want and each stage naturally rolls into the next, the conflict escalating dramatically with it. In one expedition I’m dropped off by helicopter on a cliffside overlooking a bay, in which an aircraft carrier stuffed with enemy goons is moored. A plume of pink smoke pours from one end of the ship, marking the general area of the supplies I need to find. Through my binoculars I spot and tag enemy patrols, make note of zip-lines I can use to infiltrate the carrier and, more importantly, escape on when I’ve picked up the package. I quietly descend to the deck on a line from the cliff and sneak through the ship, knifing unsuspecting guards as I go floor-by-floor scavenging for loot. By the time I get to the pink smoke, I’ve cleared most of the vessel. The supplies are in the hold and as I pick them up I move to the next stage – the escape. Picking up the package activates a timer on a GPS tracker. When it reaches zero, reinforcements will come pouring in and every enemy on the map will know my location. A call comes in from my pilot letting me know where I need to meet him for a pickup – a clear patch of beach on the opposite side of the carrier to the cliff where I was dropped off. I sprint for the side of the ship, enemy fighters on my heels as I jump for a zip-line that takes me down to the shoreline. The sound of buggies and ATVs in my ear as I run to the landing point. The LZ is exposed, a bowl surrounded by high dunes that give the soldiers visibility over anywhere I could try and hide. There’s a turret, though, and a 50. cal is all I need to fend off an army. The helicopter lands behind me as I carve up the fighters in the dunes, their vehicles exploding in blooms of flame and debris. I climb into the helicopter and I’m away with the loot. You can replay expeditions and they increase in difficulty each time, beefing up the number and strength of enemies in play. Better still, when you return to an expedition the drop-off point, landing zone, and supply cache all change position, pushing you to alter your plans and route through the play space. It’s an extremely well designed set up. Boomer, the very good boy of Far Cry 5, has unfortunately not survived the apocalypse. However you can now be joined by Timber, a beautiful Shiba Inu, who will sit in your motorbike’s sidecar and stare at you adoringly on long journeys. It's enough to melt your heart. 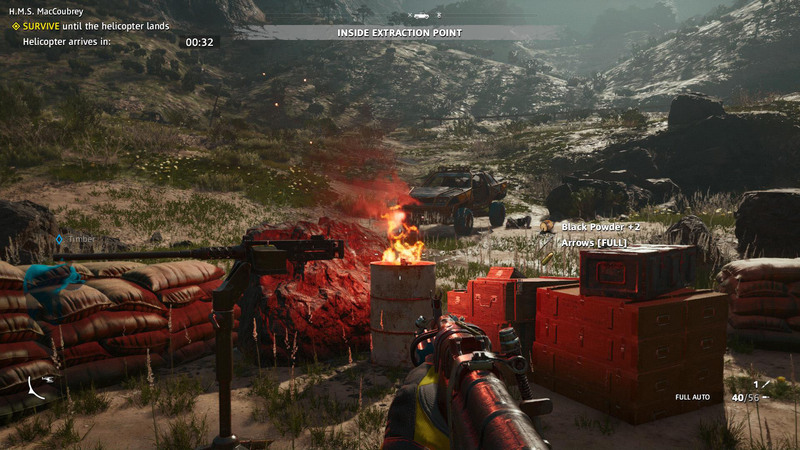 Expeditions and repeatable outposts are significant innovations for the series. They tap into what Far Cry is at its best and create more opportunities for it to be that. Unfortunately, many of the other changes that come in New Dawn distract from or obscure that chaotic core. Enemies now come in different tiers, gearing up with better armour and gear in the higher levels. The yellow-armoured champions at the top are particularly frustrating early in the game, as their body armour soaks up a huge amount of damage. They’re also armed with flamethrowers, so they’ll sprint up to you and set you ablaze. There’s little you can do to stop them. You can’t even take them down with a stealthy melee attack until you’ve unlocked the third level in a chain of melee perks. Weapons, too, now come in tiers. If you match the tier of weapon to the enemy you’re fighting it becomes significantly easier to kill them. And, when you’ve collected the materials to craft elite level weapons, you can even take out the champions with relative ease. The problem with these new systems is that the game’s balance now seesaws through the early hours of the game. When you’re starting out and you only have level one weapons, any higher level enemy is a bullet sponge. You’ll empty entire clips into them to destroy their armour and hit the fleshy human within. But, as soon as you get a next tier weapon, the enemies that were such a challenge before become easy to kill. Once you’ve got an elite weapon, everything that comes between you and your objective can be killed in a shot or two. There were few times I was playing when I felt like the equipment I had was adequate but not overpowered, making the game a significantly uneven experience. A big criticism of Far Cry 5 is just how busy the world is. You can’t go anywhere without drivers careering off the road or cultists trying to kill you. There is markedly less of that in New Dawn, but this still isn’t a quiet apocalypse. The roads are populated with roving highwaymen, traders, supply drops, and trucks carrying supplies or prisoners. It’s difficult to get from point A to point B without something interrupting you. In most cases these are fine distractions, a little bit of combat to add colour to your trip. But I also found myself trying to avoid them, because they were getting in the way of what I’d set out to do. I’d be driving to a mission and have to swap cars twice because the vehicle I began in had been blown up, forced off the road, or was simply too damaged to continue. The loudest of these distractions are the ethanol trucks. Ethanol is a vital resource as it’s what you use to upgrade the different stations back at your home base, Prosperity. Coming across an ethanol truck on the road and hijacking 100 gallons of the stuff should be a boon. Instead, I steer clear of them because once you’ve taken the truck you have to drive it back to base. That might be a 15 minute drive, one on which you’ll have randomly spawning enemy events cluttering up the journey – it’s just too much busywork. Besides the flowers, it’s the expeditions and repeatable outposts that turn out to be the brightest parts of New Dawn. They’re distillations of Far Cry at its best. They’re spaces where you can fall into the semi-planned, semi-improvised combat that comes when you mix stealth mechanics, great guns, and caged animals together. I hope they make their way into future games in the series. Where New Dawn wilts is in the systems that complicate that central loop of scouting, infiltrating, and combat. New Dawn is by no means a bad game, but it’s muddied, to the point that it becomes harder to see its best colours. Ubisoft’s open-world shooter digs into what makes the series great. Some of those experiments bear fruit, others bring frustration.